How I Won a Ninja! It’s not everyday you win a ninja. A client/friend of mine introduced me to one of his business colleagues, Jacki Neal from Peak-Resource. Peak-Resource is an Atlanta Technical Staffing firm. Peak-Resource had a contest where folks had to identify a blurred image as part of a give away campaign. Turns out that blurred image was a stapler. In true form, I not only identified what it was but what the individual parts were. (Welcome to the curious nature of my brain). How many other people would identify the parts of the stapler- Magazine, Front Foot and Anvil? 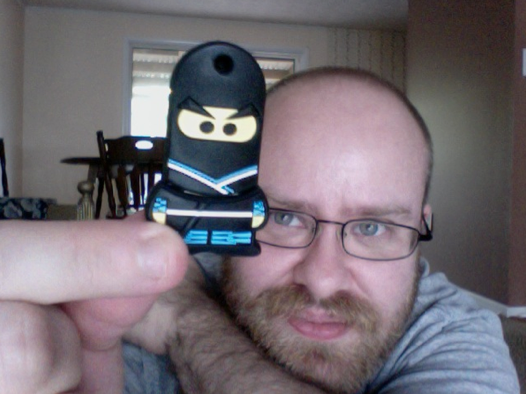 I won a 4GB Ninja thumb-drive & a jar of candy. All because of 7 minutes of research. Much thanks to Jim Munson & Jacki.